Zig Ziglar has spent his life empowering people with a message of hope. He delivers this message in the motivational stories and techniques he has offered people for improving their lives and making positive changes for themselves. Zig has reached his audiences through both his speaking and writing. As a speaker Zig has crisscrossed the globe, traveling over five million miles to spread his message of inspiration. As an author he has incited people to take action through the twenty-three books he has written, offering his insights on topics from personal growth, family, and faith to leadership, sales, and success. The story of what Zig Ziglar is all about is best encapsulated in his narrative, "Priming the Pump." The story is published in his best-selling book See You At the Top. Zig also skillfully recounts this tale at many of his speaking engagements. To read the story, published by Pelican Publishing Company in Gretna, Louisiana, click here. For the amazing positive leadership he has provided, the insightful wisdom he has generously shared, and his ability to help others improve their own lives, Zig Ziglar is the Leader of the Month for November 2004. Most admired leader: Jesus Christ because he led from a pure heart. Favorite book: The Light and the Glory, by Peter Marshall and David Manuel, for its solid, well-documented historical view of the founding of America. John L. Caton of Health and Benefit Systems, Inc. shares the following about Zig Ziglar, "Zig has had more impact on my life than any other person. I attribute the balance in my life to thirty years of his teaching. My peace of mind has come from his consistent encouragement to know God through reading my Bible. I am fortunate to know a lot of people, and I am the happiest person I know. Thanks, Zig, for all you do. Good luck, good health, and God bless!" 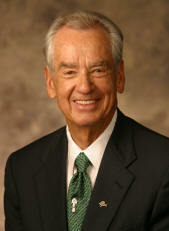 For more about Zig's background and amazing life, check out Zig, the Autobiography of Zig Ziglar. Emotional Intelligence, Daniel Goleman, Ph.D.
Zig's message: You can have everything in life you want if you will just help enough other people get what they want. Traits Zig considers most important in a leader: Integrity, honesty, courage, commitment, wisdom, humility, consistency, faith. Zig’s advice to aspiring leaders: Set the example; be a constant student, a “good finder” and encourager. What and where are the best training programs for leaders? Biblically-based integrity programs; Coach John Wooden (UCLA); John Maxwell; Ken Blanchard. Visit the website for Ziglar Training Systems, www.ziglartraining.com. 800-527-0306 is the phone number for Ziglar Training Systems.